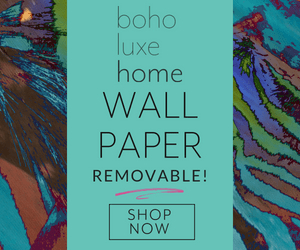 This makeover is a little different for us and, man, did we have fun with it! This months contest was sponsored by HomeRight. How awesome is THAT?? We love them! HomeRight is a DIYer’s dream. 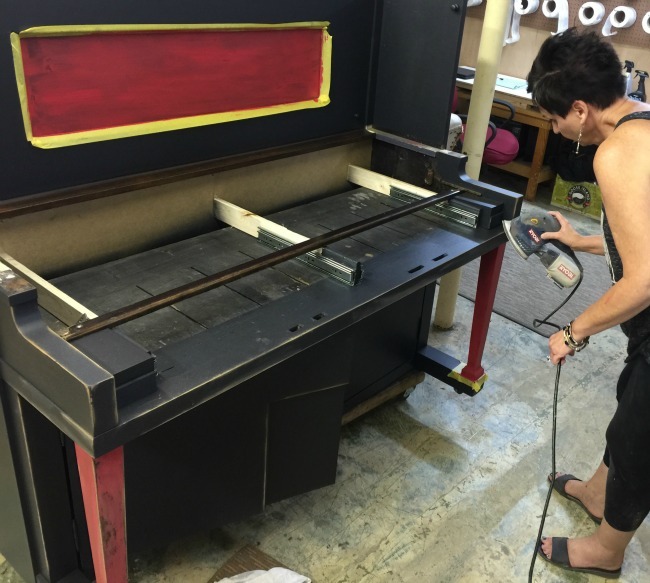 They have tons of cool products so you will enjoy looking around the website but two of my favorite products of theirs are the Finish Max sprayer that we used for this project and their steam machine. I’ll fill you in on the steam cleaner in a later post, for now check the Maid Agency, they can help you! Here’s a good one for you, I used to take piano lessons. Four very long years of my life. Why my mother insisted I do this I will never know. I couldn’t play worth a flip. My Pomeranian, Corky, would sit by the bench and howl the entire 30 minutes I had to practice every day. Even my teacher, Mr. McDonald, the sweetest man ever, told her she was wasting her money. I cannot make this up people. My mother finally came to her senses and realized that while I could learn the keys and read the music, Liberace was just not inside me. Playing did not come natural for me. I think my mother wanted to believe that I took after my father, who had an incredible voice and could play guitar by ear. She kept thinking that if I dug deep enough, the talent would emerge. I tried to tell her, Mr. McDonald tried to tell her and Corky tried to tell her. 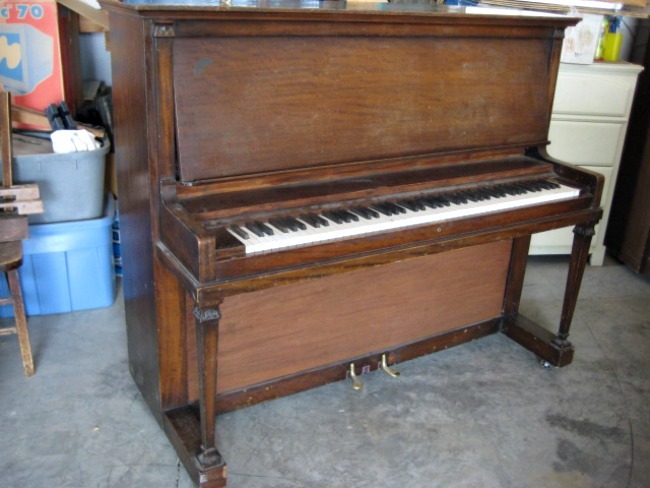 So this piano has literally been passed around my family for forty years. And it wound up being given back to me. And what am I supposed to do with this? We have well established my INability to play. Somehow we managed to begin our deconstruction without snapping a before pic. 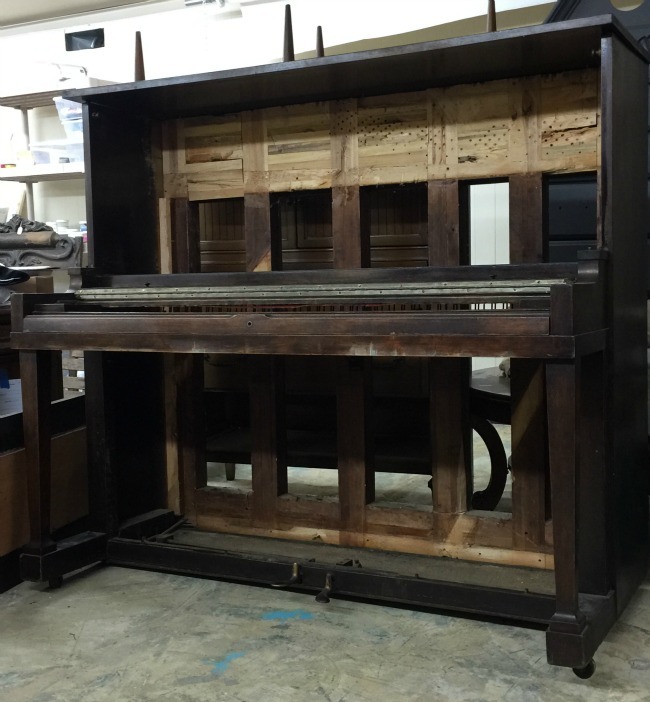 We gutted the inside and removed the keys, hammer and the soundboard. I’ve been thinking of all kinds of projects with these pieces! We also removed the top front panel and the knee panel, and the fall board came off as well. Yes these are technical terms and, yes, I had to Google them. 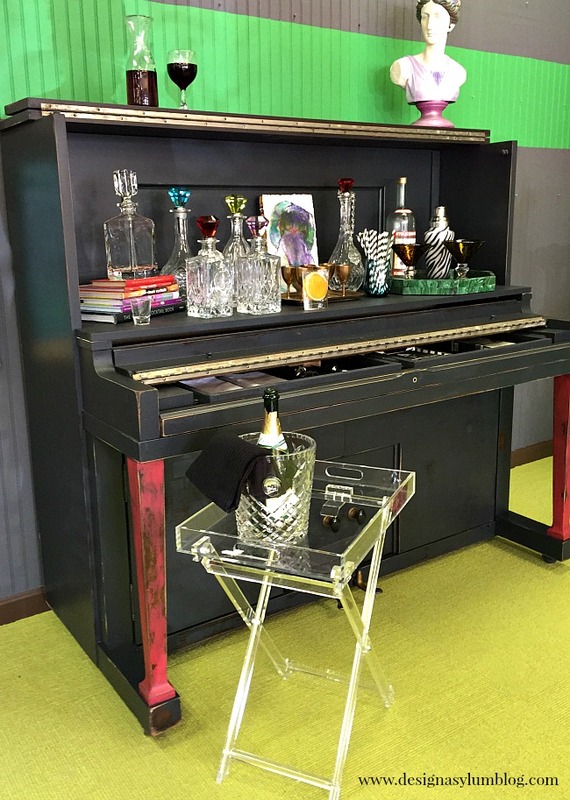 We do not have a bar at the studio, as no office should. Said no one ever. None of us actually drink much. But there are Friday afternoons that we would like to sit and just hang out for a minute. We work super hard during the week and we just do not have much time to catch up with each others lives. A little toddy on Friday afternoons to shoot the breeze and hang out without working sounds kind of nice, doesn’t it? So we decided to make a bar. 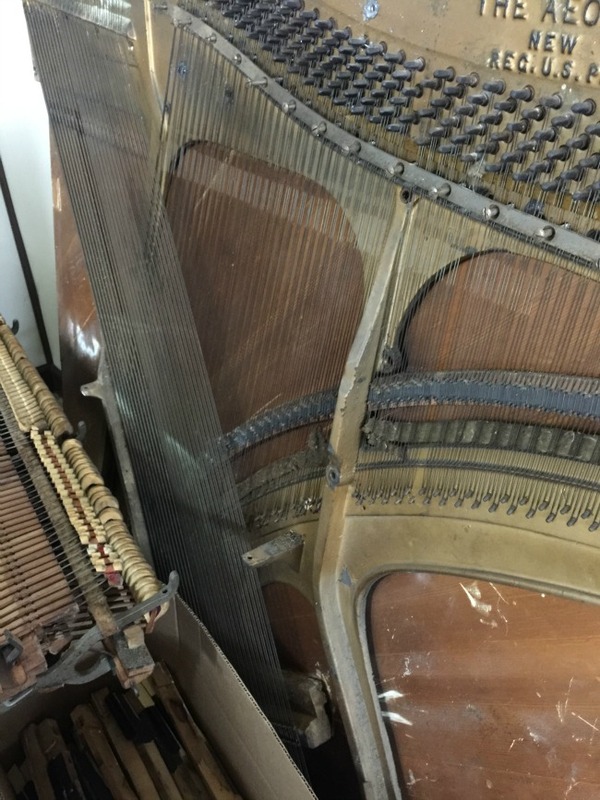 Since the piano was now basically a shell, we started by adding floors and backs. We added a center divider so that we could create storage for wine and liquor. The wine would be stored on it’s side so The Accomplice made two “X”s. We placed one in the back of it’s section and the other in the front. 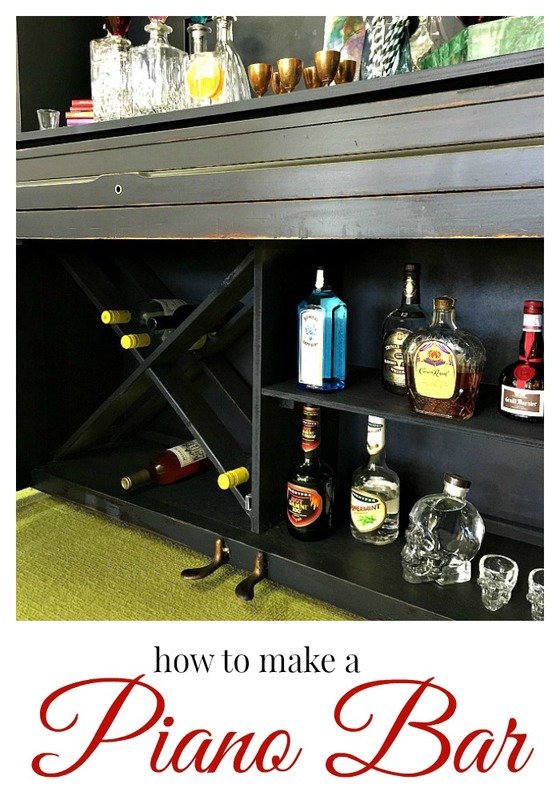 For the liquor side we simply added a shelf in the center. I wanted to reuse as many pieces as possible from the piano. We took the top front panel and pushed it to the back of it’s space. 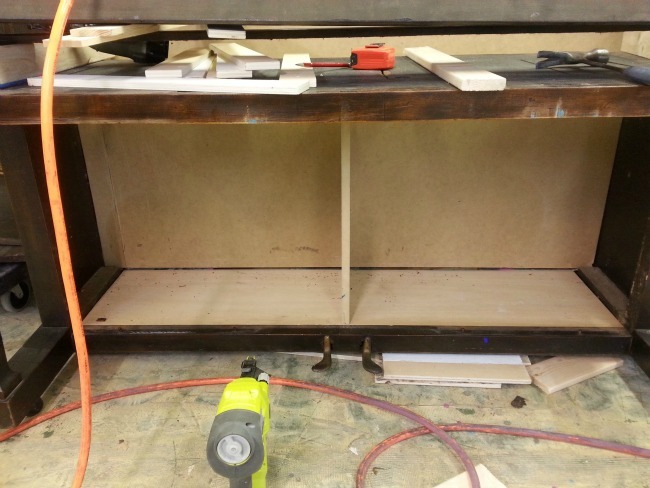 We used the knee panel by cutting it in half to create cabinet doors for the storage area. Now the fun really begins! The spraying!! Can I just tell you how much men love their toys? I practically have to wrestle the sprayer away from The Accomplice. The Finish Max Fine Finish sprayer is absolutely the bomb diggity. He loves it. I love it. It’s easy to use and it’s easy to clean. 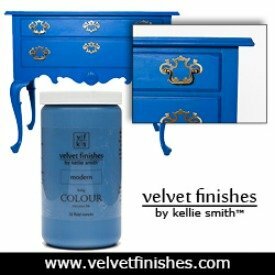 We used Velvet Finishes paint and base painted in Luxurious. 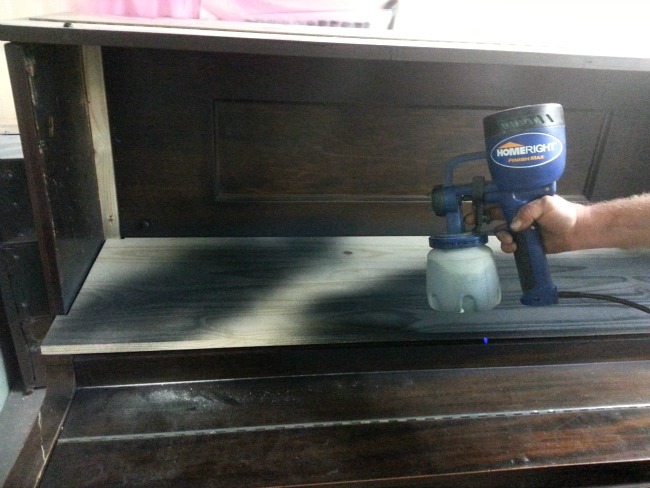 The sprayer comes with a viscosity cup that makes determining the thickness of the paint so simple. 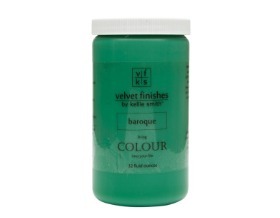 Add a little water to the paint, pour it in the container, attach it to the sprayer and you are ready to go. Smooth motions, right and left with the sprayer and you will not believe the amazing finish you will achieve. With the spraying complete, we moved on. Where the keys once were, we added drawers. 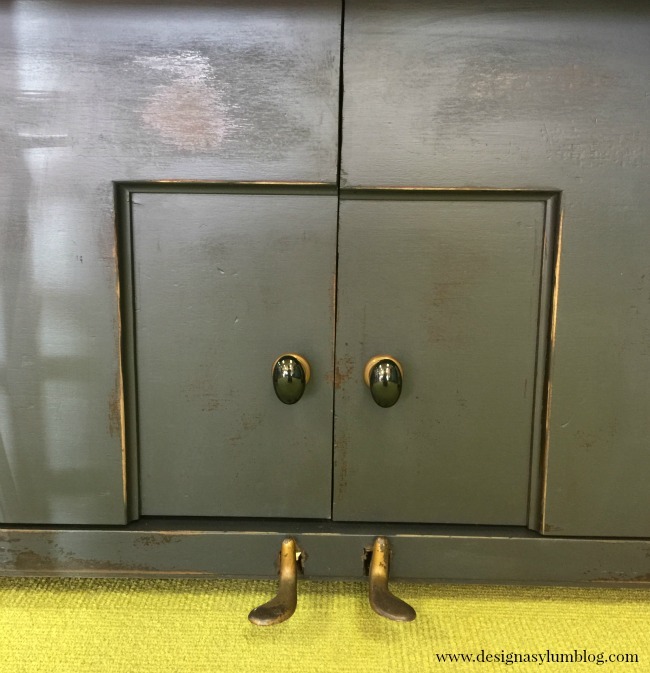 We used the key slip as the drawer front and built two drawers the same way we built this tray. 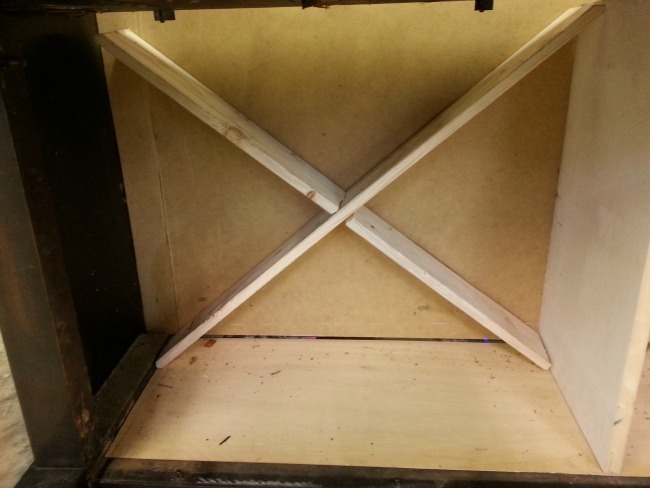 We simply put a strip of wood on the sides and down the center so we would have something to attach the drawer slides to. I painted the legs red over the black, I needed a little touch of funky. I also painted the center of the top panel but I took it back to black. I lightly hit the edges with my electric sander. I distressed with a heavier hand on the legs. After the distressing was done, I glazed the entire piece. After glazing the piece was complete! Thanks to the HomeRight sprayer, this project went quite quickly, even with all of the rebuilding we had to do. 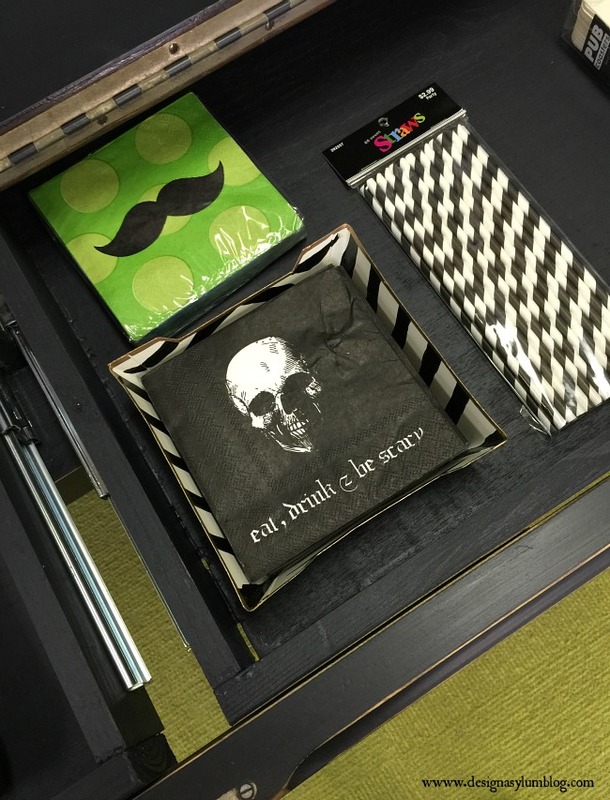 The drawers are shallow but perfect for napkins, coasters, towels. You would even have room for a cutting board and knife. Aren’t the napkins fun? Thank you to The Handler! I love the egg shaped knobs we found. The back plate has the same worn patina as the foot pedals. I am being serious when I tell you I cannot even remember what the pedals do. I’m really happy with the way the piece turned out and I’m looking forward to chillaxin with The Accomplice and The Handler on some late Friday afternoons soon. 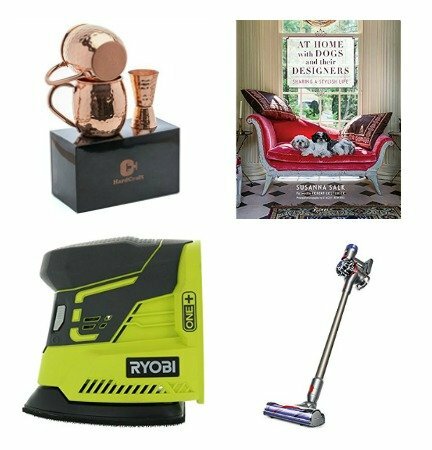 To wrap it up, a big thank you goes out to HomeRight for sponsoring this months Fab Furniture Flippin’ Contest. Go check out the website right now. And thank you to all the FFFC hosts, they work hard at this!! This month’s Spray it Pretty theme was hosted by Evey and Lynn. 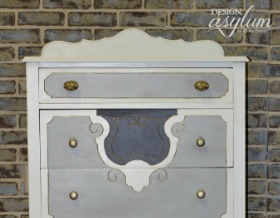 Be sure to pop on over to their blogs and check out more cool projects. 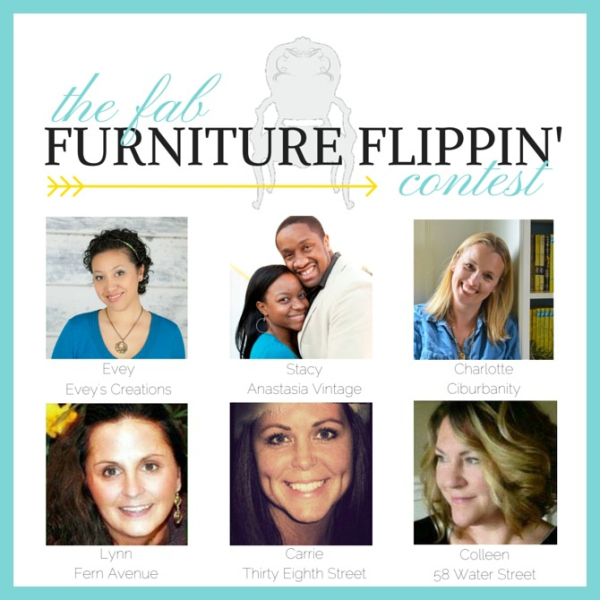 Any bloggers out there interested in being a part of the Fab Furniture Flippin’ group can email info@fabfurnitureflippincontest.com for information. Sponsors and themes change monthly and the contests are a lot of fun! This project was sponsored by HomeRight. I received septic tank pumping carlisle pa from the sponsoring brand. My rave reviews and love of the of the HomeRight sprayer and product line is 110% my own opinion. I love this sooooo much. I have so many pins of piano projects. It would be a shame for me to never get to do one of them. Yours looks simply fantastic! Lucky you. Hi Karen! This was definitely a fun project! So happy you like it! I’ll check out you Pinterest boards. 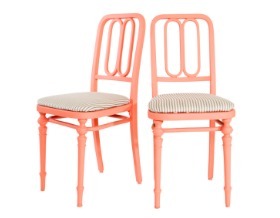 Good grief I have a love/hate relationship with Pinterest! Lol!!! Thanks so much for stopping by! 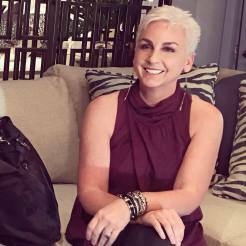 Jenna. I did this all for you. I am still incredibly embarrassed that I did not have my A-Game on with my drinking last time you visited. The therapy is helping but the therapist said I needed to build a bar and have you visit again. I thought it was a good plan. LMAO. Glad you found your true calling because this is knocking my socks off right now! Great job. Love a good flip. Lol Jamie, you’re no Liberace either? All those hours and I seriously cannot even play chopsticks! Thanks so much for popping by the blog. 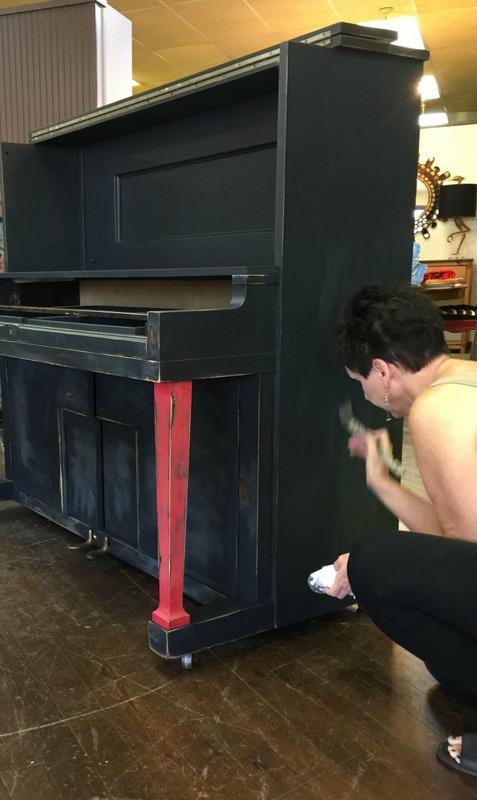 I have been hunting Craigslist for a few years for an affordable vintage piano for re purposing what seems like forever, your project came out wonderfully Kellie! Thank you Ashley! I’ll be keeping this one!! Thanks so much for stopping by the blog! 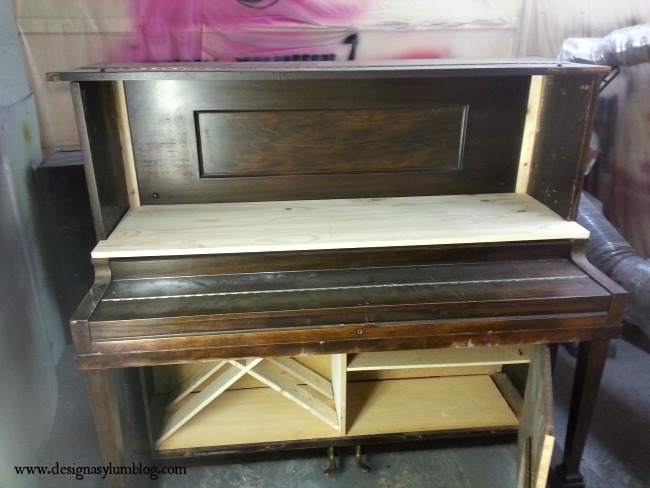 This is an amazing upcycle!! I would be afraid to cut up a piano, but the result is great. Thanks for sharing on the #HomeMattersParty . I hope you will join us again next week.